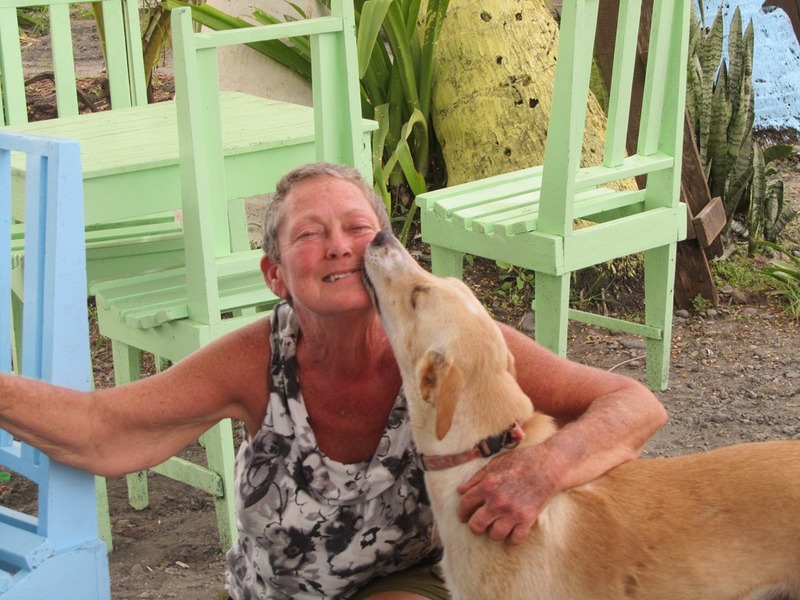 Yesterday I got the opportunity to meet two dog lovers who are as passionate as I am about those four legged heart stealers A few months ago I was contacted through my blog by a young man asking if I could recommend a veterinarian here in Puerto Viejo. His twelve year old black lab named Maggie was not doing well and he wanted to find a trustworthy vet. I recommended my vet and he brought Maggie down. A few weeks later Maggie passed away. Early last week, he contacted me to let me know he was now looking for a new dogfriend and asked me to let him know if I heard of a dog needing a good home. I decided to post his inquiry on a buy/sell facebook page we have here in Puerto Viejo and that same day was contacted by a wonderful woman named Iris. 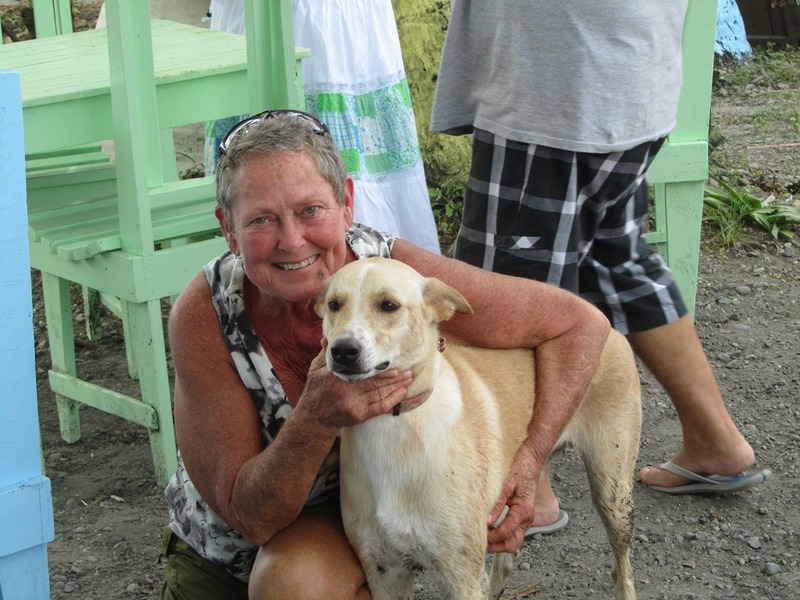 Three months ago she rescued a dog that she thought was about six months old who was starving on the beach. The dog was unable to stand because he was so badly starved. She quickly took her two dogs home and ran back to the beach to get the dog. She got it to the vet and nurtured it into a most beautiful and loving animal. She may have to leave Costa Rica and felt that the best thing for him would be to find him a good home. I gave them each other’s contact information and the rest is history. 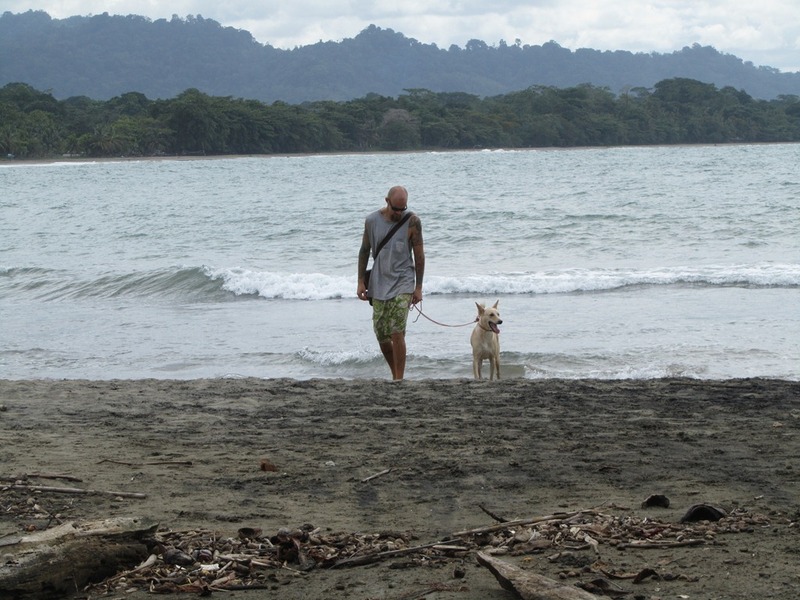 The young man came to Puerto Viejo yesterday on the bus and I took the two of them back to his farm north of Cahuita. It was very hard for Iris to give the dog up but she could tell that Clay was a dog lover through and through and so that may have made it a bit easier. At any rate, Snickers (now Stegner) will be living the life of a very pampered friend. He deserves it!! Hola! Thanks for your blog, I enjoy reading. Your great advice also helped me get my 2 dogs down safely through Frontier Airlines! I’m living right outside Cahuita in Hone Creek. Could you recommend a Vet? It seems like you are very happy wit yours! Also, our dogs love to go everywhere with us, could you recommend some dog friendly places and/or things to do around town? Could you direct me to where you give the gettng dogs to Costa Rica on Frontier Airlines info is? I am coming with Hubbie and two Chihuahuas next April and wonder if it is safe for them to fly as cargo, or is it possible to fly with them in cabin. They weigh less than 5 lbs each, and from what I read, I am going to keep close watch on them to make sure they do not end up as snake dinner. I loved this story so much! thanks for sharing it and thanks to the compassionate women who made it possible. especially to Iris for rescuing the dog from the beach. When I have had the ability to do so I have rescued a number of dogs and cats, and I applaud those who rescue and those who find good homes. Thank you! Hi, have just moved to PV and have an 8 week old puppy, 2 questions – can you pls recommend a good tick treatment here (frontline plus isn’t recommended in Aus as it supposedly doesn’t give full cover) and any other tick prevention you use that seems to work here, and which vet would you recommend? She’s already had her first round of vaccs from one vet but I’d like to do a bit of ground work. Gracias! 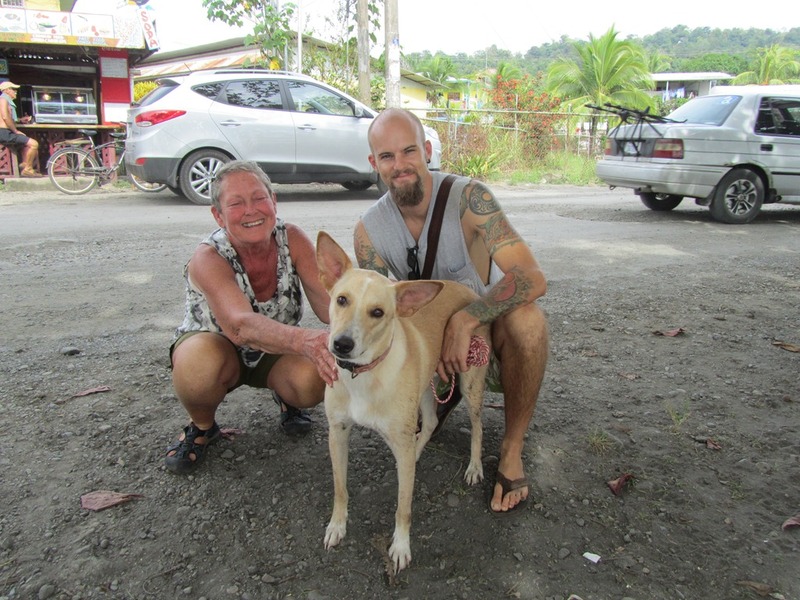 Hi Robyn and welcome to Puerto Viejo!! I think the very best thing to do would be to talk to the vet about the different treatments. We switch them up every few months as the dogs seem to develop a tolerance for different products after time. Last time we got a pill that worked great but it is expensive and I don’t know if a puppy can take them. We take all our dogs to Dr. Estefania Solano. Her clinic is on the main road heading from PV towards Cocles. She has been absolutely wonderful over the years with all of our dogs. Thanks so much for your reply! I’ll take her to see the vet you suggest on monday! Your blog is super helpful for newbies like myself!